Random Collection of Notebooks. Samurai notebooks help keep me inspired, searching, while at the same time keeping me anchored. I’ve mentioned samurai notebooks lately, but haven’t really gotten into detail about them for a while. Samurai notebooks are notebooks where you put positive ideas, plans, information, etc and review on a regularly spaced basis. 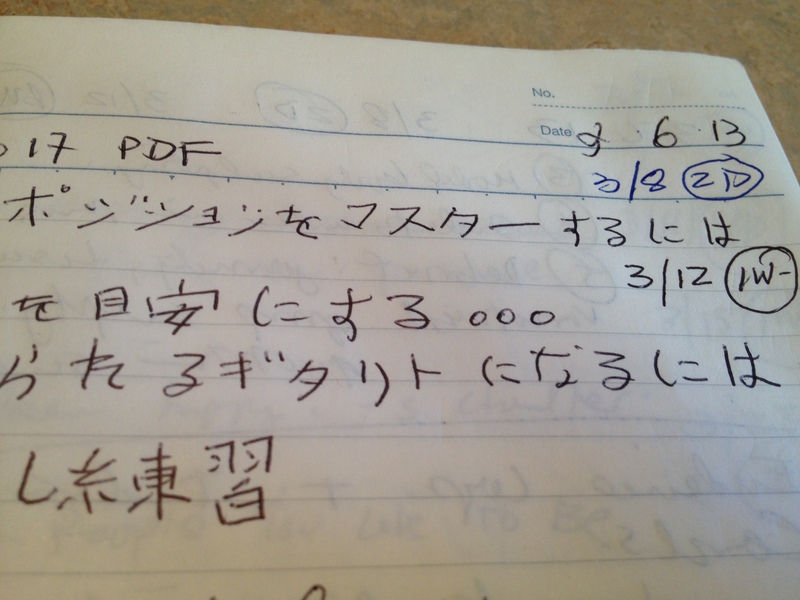 My samurai notebooks aren’t necessarily pretty, but they have been transformational. A samurai notebook helps you create your own channel, the information and ideas that you brush up against. You can bathe in the fear, sarcasm, and negativity that gets offered up 24/7 or you can create your own channel. A notebook helps you direct your life by helping you remember. Adding spaced repetition keeps reviewing from becoming burdensome. Buy any notebook. Think cheap and sturdy. 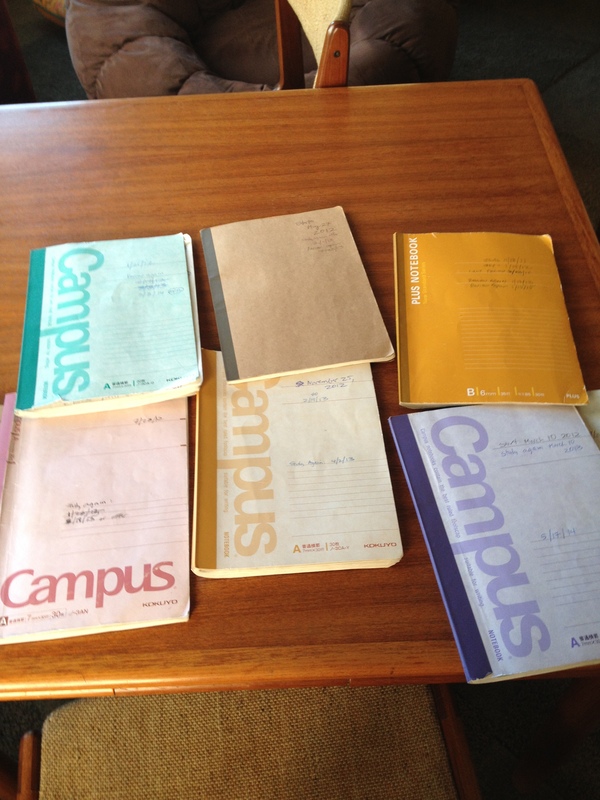 I prefer Campus notebooks from Japan but don’t get hung up on what kind of notebook to get. Put any information, thoughts, plans that interests you into this notebook on a daily basis. Make sure to date each entry. Recently my notebook includes snippets of guitar/music theory, helpful hints from a Japanese book on guitar, and ideas from several teaching resources. Review the notebook every day. If you’ve put interesting and valuable information it will become a fun process. I put a date on the review and mark how many days from the original date. I try to review according to the following schedule 1, 2, 3 or four days, and a week after the original review. After that it is one week, two weeks, 1 month, 3 months, 6 months, 1 year, etc. I use a timer and review five minutes every morning. I also review if I feel like it on train rides, appointments, etc. Dating entries and reviews are important. It would be overwhelming if you didn’t space out reviews. I’ve learned to alternate between “New” reviews and “Old” reviews. One day I will review the most recent reviews and the next day, I will begin from an earmarked “Old” page. “New” information gets to “mature” and “old” information gets a systematic chance to get refreshed. I write “New” or “Old” on the day’s entry to let myself know where to go in the next session. Date the cover, depending on the last entry. This notebook will be up for review in two years. If anything hits me like a lightning bolt from an old notebook I make sure to a) put it in a more recent notebook and/or b) do something with the idea or information. 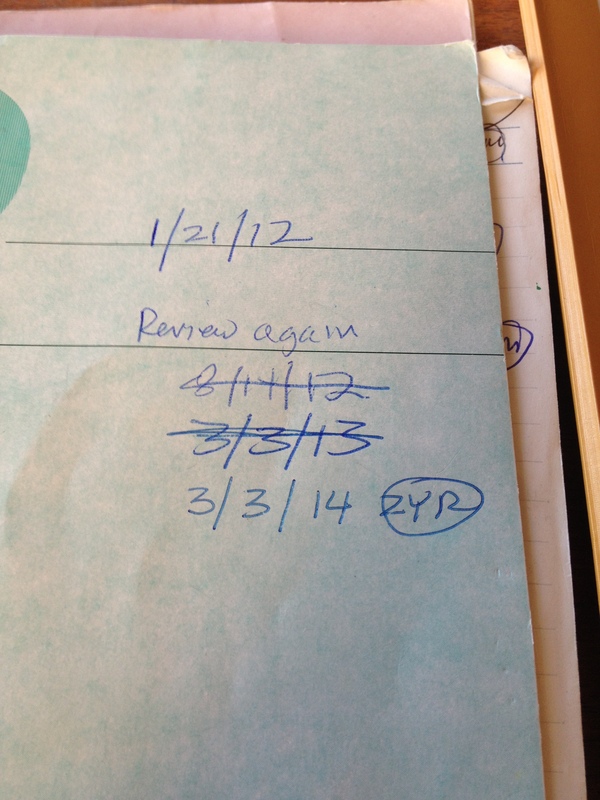 When you finish with a notebook, mark the outside with when the next review date should be. Feel free to use any or none of these methods. According to Coyle, Eminem uses scraps of paper tossed into a shoe box. Whatever you want to do, some kind of notebook will help you get there. Try my samurai notebook style or flow into your own style. A simple little notebook could transform your life. Are all your entries in Japanese? No. I go through different grooves. I put everything in my notebook, including ideas that might help me as a teacher or really powerful or fun ideas from different sources. Because I review it regularly it becomes more of my internal programming. Thanks for the question!